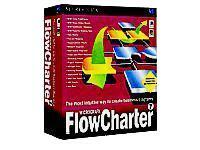 FlowCharter 7 is a business drawing, diagramming, and charting tool. It can be used to create organization charts, network diagrams, statistical control charts, and flow diagrams of any type. It can also be used to create freeform drawings to embellish and annotate diagrams. FlowCharter 7 incorporates the use of wizards and templates that enable users to create over 20 different diagram types; perfect for the novice PC user with little or no artistic background. FlowCharter 7 incorporates a new technology called Living FlowCharts. Living FlowCharts allow users to create "executable" flow diagrams that can be used in an interactive and dynamic fashion where rules and procedures can be assigned to shapes and lines that determine the interaction between the user and the chart. Plus, FlowCharter 7 provides extensibility for custom solutions with support for Microsoft Visual Basic, transforming static charts into dynamic diagrams that better reflect the way people work.